FIELDS and parks in and around Henley have been left parched by the heatwave. 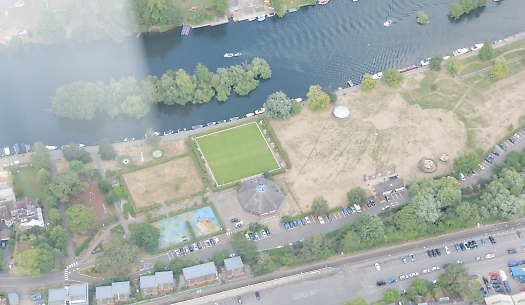 Aerial photographs taken by the Henley Standard show the extent of the damage to the usually lush grassland that has turned shades of yellow or brown following sustained temperatures of more than 30C and little rainfall. The tinder-dry areas include Mill and Marsh Meadows, Jubilee Park and the site of Henley Royal Regatta in Remenham. 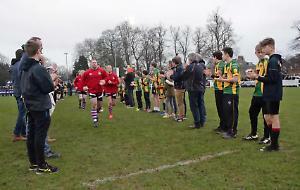 They appear in stark contrast to the green areas which are regularly watered and tended, including the bowling green in Mill Meadows and the Henley Cricket Club pitch off Matson Drive, as well as the all-weather pitch in Jubilee Park. Our pictures also show evidence of field fires which have struck farmland in recent weeks. These included a huge blaze in a straw field in Shiplake on Thursday last week. Homes and businesses were evacuated after farm machinery caught light in the field off Shiplake Row and quickly spread as a result of strong winds. Golf clubs say they are using more water than normal to keep greens and tees in good condition. Henley Golf Club is one of many to have its own private boreholes rather than relying on mains water. The club has so far used about half its allowance with several potentially several dry months still ahead. Mr Lovelock said the club would manage its supply. “If it looked like we were getting to the stage where we were getting low we would leave tees,” he said. “We would used bowsers to keep the greens alive. “I don’t want anyone to turn up here and it’s lush green when other people are being limited. If you took an aerial picture we would be one of the brownest areas, apart from the greens and teas and we have a responsibility to our members to keep them alive. He added that the on Friday night and during Sunday meant the grass was greening again. Jon Connell, managing director of Badgemore Park Golf Club in Henley, said the club had its own borehole and an irrigation system was installed in 2004 so the course was automatically watered when the club chose. He said: “We’re being very conscious with the water we use and only using it where absolutely necessary. “We concentrating on the greens and tees and the approaches but we have the capacity to water our fairways but we’re choosing very carefully how much we put on them. “We’re just tickling them along so they remain green and alive and not dead or dormant. “We’re delighted with the condition of the course. It’s playing really, really well. Mr Connell said if a hosepipe ban was introduced and the club was not allowed to water the course, it could damage the business. “The grass would die off and to get it back is an exceptionally expensive exercise,” he said. “In 2002/03 we totally lost all the fairways because we didn’t have the ability to water. That’s why we made the investment in 2004. “Whave are very pleased that we made that decision because it has stopped the same situation happening again.” Hennerton Golf Club in Crazies Hill has a 300ft deep bore hole and a sizeable allocation of water. Mr Hearn said the club had a licence from the Environment Agency to use up to five or six million gallons of water a year but it had never reached that amount. He said: “We pump it into a small lake and then it’s pumped around the course. “The course is looking quite good actually apart from the brown fairways, of course, and the greens are playing well. Henley Cricket Club also has a borehole from which it can draw water. Last year he was watering the square once a week but this year he is doing it almost every day. Mr Jacobsen said: “You water at night-time and very early in the morning so whatever you put down doesn’t evaporate. He uses a “trailed” sprinkler system which works its way across the square and takes about 20 hours to water the whole area. He said the club didn’t want to appear to use too much water. “It’s trying to balance making sure we get the health and safety aspects right as well as being socially responsible and not using too much,” he said. Mr Birkett said the club tried to do as much watering as possible at night. Jeff Sheldon, vice-chairman of Kidmore End Cricket Club, said he, his father John and volunteer Brendan McKenna helped water the ground. He said: “We’ve managed to keep on top of it. The outfield is burnt to a crisp but the wicket has been very good but that’s a testament to the hard work. “It’s a case of making sure we water heavily and at the right times. We probably water three to four times a week but we don’t do it all day. We have a fairly small sprinkler system so we move it around or we water by hand. “Given that it has been ridiculously hot we have been watering Sunday night, Monday and sometimes Tuesday to get to really wet. Henley Golf Club, in nearby Harpsden, appears to have escaped much of the damage along with parts of the neighbouring Harpsden cricket field. Temperatures this weekend are expected to reach as high as 30C, and there is little or no rain forecast for the next two weeks. • The Henley Standard was flown over the area by helicopter pilot Hugh Barklem, who lives in Lambridge Lane, Henley on Tuesday.